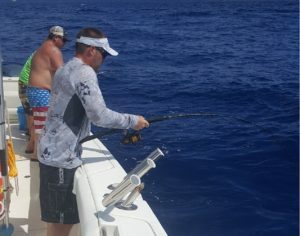 Teaming up with Capt Harlan Trammell (Piner Wahoo) www.american-allegiance-charters.com on some trips. We run on my World Cat and he makes sure you keep on the fish. 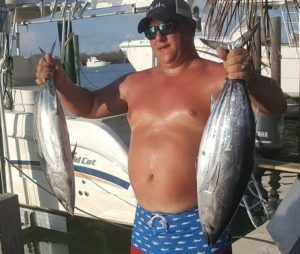 This trip was with Chris (landshark82), brother Phillip and friend John. We had a great weather window so the marathon hump was our waypoint. A little bumpy on the way out but the World Cat busted thru. Saw one frigate working on the way out so we stopped and trolled that area but no takers. Throttled up and pointed south towards the humps. Saw a lot of birds working on north edge so we put out a feather and it was not long before we were hooked up. Black fin tuna gave a nice run until the shark got him. We repeated 4 or 5 more times and never came close to getting a BFT to the boat. While investigating one last group of birds we saw some strange activity. We slowly approached and found that a shark had balled up a bunch of bait. Harlan grabbed the cast net made a great throw and now we had a ton of live baits to try. As he pulled them in their scales fell off and blanketed the water with silver. That was going to change things up – drifting with a well full of livies. We cleaned the deck and got prepared to drift with live bait. As we got ready to motor over we noticed the bait was already dead. They didn’t last one minute. Off to set our drift with fresh dead bait. First drift and in no time we had one hooked up. 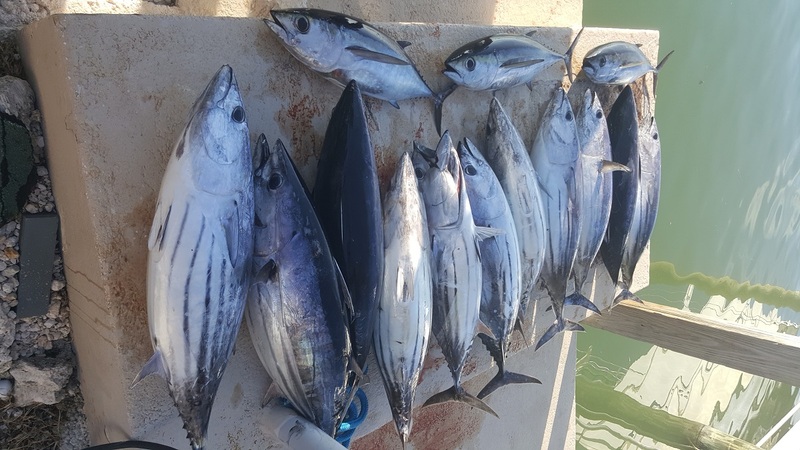 This was a chunky tuna it gave the angler and penn 6500 a good work out. We did 4 or 5 drifts with double and triple hookups. We could have had 6 on but triples caused some tangles. They were going crazy over this magic minnow. We did not know what is was – some kind of sardine. They bite was awesome as we were able to chum them right up to the boat. 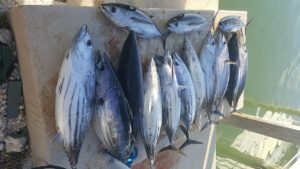 Left with lots of action still at the boat but we had plenty of tuna in the box . All three were experienced anglers which really helped because these were some hefty skippies. Pointed to Cat back north and started looking for signs of dolphin. Found 1 frigate bird working we trolled that area but nothing. Back on a northly course looking for rips or weeds. Finally found small rip with scattered weeds in about 250’. Trolled west and picked up 3 Black Fins to top off the fish box. 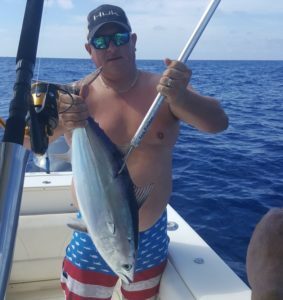 It was an exciting trip and with the help of the magic minnow we had an epic tuna bite. Harlan and I enjoyed a blue water day with three great guys and no land insight.